The president even sought to pin the blame for rising prices elsewhere, citing instability in the Middle East as one example. But as this chart shows, the Obama administration simply hasn’t focused on reducing our dependence on foreign energy. In fact, energy production on federal lands has dropped by 11 percent. JUNE 27, 2009 - President Obama urges the Senate to adopt House Democrats’ “cap and trade” national energy tax, the same one the president once admitted would cause electricity rates to “necessarily skyrocket.” Then-GOP Leader Boehner later said the bill “would raise electricity prices, increase gasoline prices, and ship American jobs to countries like China and India.” Gas is $2.50 a gallon. JUNE 21, 2011 - The White House opposes the House-passed Jobs & Energy Permitting Act that would unlock an estimated 27 billion barrels of oil and 132 trillion cubic feet of natural gas. Gas is $3.65 a gallon. Republicans are working to address high prices and create new jobs by removing government barriers to energy production and stopping policies that drive up costs. You can “like” the American Energy Initiative on Facebook and learn more about the GOP Plan for America’s Job Creators at jobs.GOP.gov. 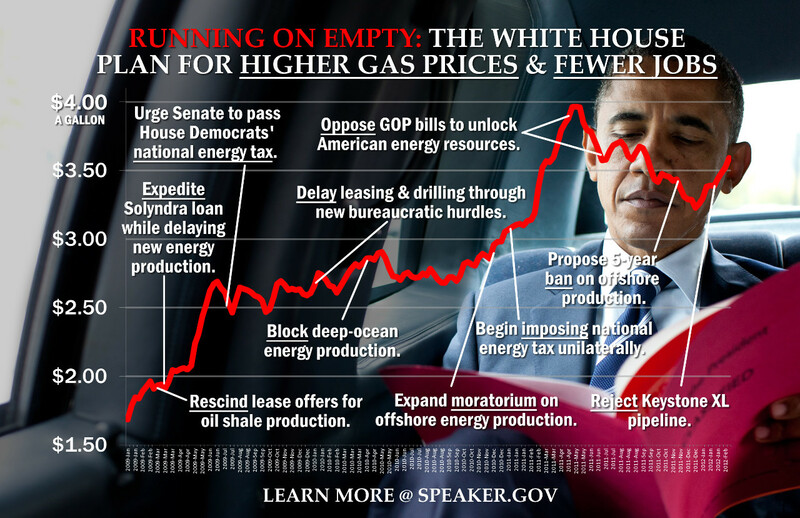 Tags: running on Empty, chart, White House , higher prices To share or post to your site, click on "Post Link". Please mention / link to America's Best Choice. Thanks! 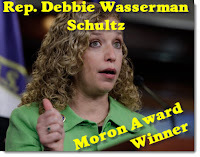 Debbie Wasserman-Schultz (D-FL) and ChairAnimal for the DNC can prefabricate more crap that former Gov. Howard Dean (D) ever did. Wow, Howard Dean just received a low grade complement. DNC Chairwoman Debbie Wasserman Schultz says Americans "overwhelmingly support" entitlements that are included in Obamacare. Wasserman Schultz also calls the GOP field "extreme" and says they want to "tell women what we have to do with our bodies and control when and whether we could have a family by not allowing us access to contraception." . . . "by not allowing us access to contraception without a co-pay and without a deductible. That's why I say the one-word application to that field is extreme." Wasserman-Schultz does not represent the beliefs of her district or the rest of Floridians. She represent the National DNC which has been hijacked a long time ago by extremist progressive socialist radicals and does the bidding not of her constituents but of the Obama machine. 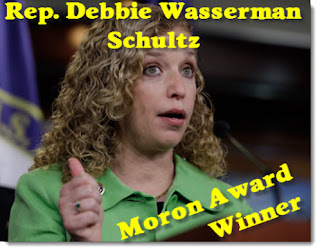 It is time for the Democrat's Darling Debbie to be retired! Tags: Debbie Wasserman-Schultz, Wasserman-Schultz, Florida, Democrat, mouth piece, To share or post to your site, click on "Post Link". Please mention / link to America's Best Choice. Thanks! Posted by Bill Smith : Post Link --> 6:54 PM 3 Comments - Share Yours! Bill Smith, Editor, NFRA Member: I have been asked if the Republican Party cares about or knows about UN's Agenda 21 and its impact on the property and personal rights of American citizens. My answer has been yes. However, until the Republican National Committee publicly acknowledged the existence of Agenda 21 and the issues, it has been difficult to convince those who asked the question that the RNC is concerned. The RNC has done so now. In addition, the identified "Conservative Wing of the Republican Party," the National Federation of Republican Assemblies (NFRA) has also lead in the effort. It would do well for conservatives to align with the Republican Assemblies chapters. While these chapters and state organizations operate independent of the political structure of the RNC and republican state organizations, the members of the NFRA are active as conservative republicans voices within the Republican structured organizations. Previously without such acknowledgment of Agenda 21 and is objectives by the RNC, it has been difficult to convince the general public including some conservatives that major threats exist to property rights of Americans under UN's Agenda 21. Agenda 21 agreements and funding via grants to government agencies and organizations carry with them obligations which can bind members and communities to international and UN agency agreements, regulations, etc., established by foreign nations or their representatives and which acceptable to the American citizens, our American beliefs and ideals, or our Constitutional rights. The biggest treat is to individual property rights and to community owned property. Threatened property rights include the ability to make individual decisions about ones own real property (land, water rights, mineral rights, use rights, etc.) and to personal property including livestock, use of animals, equipment, tools and eventually money and exclusive ownership of that property). Included is the threat of limiting a person's ability to use their own land or property or to even live and work in a one's geographic area / region. Relocation of humans appears to be part of Agenda 21. UPDATE: The Republican National Committee approved the resolution exposing Agenda 21 at their Winter Meeting, January 13, 2012. The resolution will be recommended for adoption into the Republican Party Platform at the 2012 Convention. See the resolution (PDF) . Note: the resolution is the third from the top. It has been reported that the Republican National Committee (RNC)passed a resolution exposing Agenda 21 for what it is: a disregard for American freedom, private property rights, and a key player in the Leftist move toward a one world government. Agenda 21 (ICLEI) assaults the very foundation of America. The RNC has not yet made an official statement or released the resolution. We call on the RNC to release this immediately, and we salute the individuals who signed this document. Tags: 2011 NFRA Presidential Preference Convention, NFRA, National Federation Republican Assembly, Agenda 21, Liberty, Property, Republican National Committee, RNC, United Nations To share or post to your site, click on "Post Link". Please mention / link to America's Best Choice. Thanks! Posted by Bill Smith : Post Link --> 2:19 PM 0 Comments - Share Yours! Posted by Bill Smith : Post Link --> 1:14 PM 0 Comments - Share Yours! Trey Radel is running for Congress in Florida's 14th District. Trey is a former radio and television personality and local businessman. He was interviewed by Duane Lester, All American Blogger, at CPAC 2012 in Washington D.C. Tags: United States, Congress, Candidate, Florida, District 14, Colonel, Trey Radel, video, Duane Lester To share or post to your site, click on "Post Link". Please mention / link to America's Best Choice. Thanks! Tags: citizen journalist, blogger, free speech government abuse, shield laws, protect your voice, promote accountability, transparency, protect source, access to public information, Valentine Day, To share or post to your site, click on "Post Link". Please mention / link to America's Best Choice. Thanks! Rep. Allen West (R-FL): As someone who grew up in inner-city Atlanta, I understand there are times when people need whatever help they can find. The social safety net—in conjunction with generosity from neighborhood groups, churches, charities, and private companies—can help lift Americans out of poverty and toward the path of self-reliance and individual prosperity. However, that “net” should never turn into a “hammock”—and that is what this President and his policies are allowing. This annual study by The Heritage Foundation analyzes federal assistance programs for everything from housing, health care, and food stamps to college tuition and retirement assistance. And there are some alarming numbers indeed. An estimated one in five Americans now receives aid from the federal government. That translates into more than 67.3 million Americans who rely on federal dollars for their way of life. Additionally, the amount the average American receives in federal benefits jumped to $32,748 in 2010; this surpassed the average working American’s disposable personal income of $32,446. At the same time, the federal taxpayer base continues to shrink, with nearly half of the U.S. population not paying any federal income taxes. Is this a vision of President Obama’s doctrine of fairness and economic equality? Our democratic government is at risk when there are more Americans who are wedded to the federal government— either by subsistence or employment check—than federal taxpayers to pay for the rampant spending. I fear the future does not hold much hope for reversing this trend. With the impending retirement of 77 million baby boomers and the continued liberal march toward government involvement in all parts of life, the trend in the number of Americans dependent on Washington seems to have only one direction: up. But I have hope. The essence of the American spirit does not want to be obliged to government for our daily routine. Americans want to fight for their independence and be successful providers for themselves and their families. We in Congress need to do our part to aid the struggle for more personal responsibility. We need to reduce government spending levels so we are taking less from America’s producers of economic growth. We need to take a long, hard look at these assistance programs, eliminating duplicative efforts and directing aid first to the neediest of our population. We also have to embolden charities, local groups, and private-sector initiatives to empower individuals through programs that require more “skin in the game.” Far too often, these good Samaritans are pushed aside by government zeal to provide inferior and bureaucratized services. And finally, we need to reform entitlement programs like Medicare and Social Security so that they are viable for future generations without bankrupting our country. Your independence is a precious gift, protected by the Constitution and enshrined in the Bill of Rights. Fight for it. I know I will. 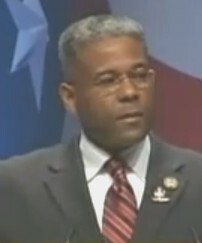 U.S. Representative Allen West (R–FL) represents Florida’s 22nd District in Congress and a member of the House Republican Study Committee. This Guest Blog was previously posted on The Foundry. America's Best Choice endorsed Allen West in 2008 and 2010 and have appreciated his conservative stands in Congress not only for Floridians but for all American. Tags: Allen West, Florida, dependency index, Entitlements, government dependency, index of dependency, safety net, To share or post to your site, click on "Post Link". Please mention / link to America's Best Choice. Thanks! Posted by Bill Smith : Post Link --> 12:18 PM 1 Comments - Share Yours! Marco Rubio: Is America Still An Exceptional Nation? Tags: Video, CPAC, CPAC 2012, Speech, Conservatism, Conservative, Marco Rubio, Florida, Republican, Washington, D.C., Senator, Conservative Political Action Conference To share or post to your site, click on "Post Link". Please mention / link to America's Best Choice. Thanks! Posted by Bill Smith : Post Link --> 9:42 AM 0 Comments - Share Yours! Karen Harrington is running for Congress in Florida's 20th District and is challenging Democrat liberal and Democratic Chairwoman Debbie Wassermann-Shultz. She was interviewed by Dave Elswick for the Dave Elswick Show on KARN News Radio (Arkansas) at CPAC 2012 in Washington D.C. At the interview were Curtis Coleman and Glenn Gallas. Tags: Karen Harrington, candidate, Congress, Florida, District 20, FL-20, Dave Elswick, KARN News Radio, To share or post to your site, click on "Post Link". Please mention / link to America's Best Choice. Thanks! Posted by Bill Smith : Post Link --> 6:09 PM 0 Comments - Share Yours! Col. E.J. Otero is running for Congress in Florida's 11th District, He was interviewed by Duane Lester, All American Blogger, at CPAC 2012 in Washington D.C.
ARRA News Service - American's For Prosperity: Two different visions for America. President Reagan launched his effort to return America to greatness with simple but profound words during his first inaugural speech, "In the present times Government is not the solution to our problems. Government is the problem." From there he put words into action passing historic tax cuts, cutting back on onerous government regulations and the results of the President's free market policies: Growth, Prosperity, and Hope. Happy Birthday President Reagan - we miss you! Tags: two visions, America, Ronald Reagan, Barack Obama, Reagan's 100 Birthday, video To share or post to your site, click on "Post Link". Please mention / link to America's Best Choice. Thanks! Posted by Bill Smith : Post Link --> 12:55 PM 0 Comments - Share Yours! By Ken Blackwell, ARRA News Contributing Author: The first thing the next President must do is return America to sustainable economic prosperity. This begins with four actions: two to balance revenue with spending and two to unleash America’s potential. He should initiate a national campaign for a balanced-budget amendment to the Constitution, capping federal spending at 18% of GDP. Tags: Ken Blackwell, important action items, next President, economic prosperity, fundamental tax reform, flat tax, repeal regulations, national energy policy, energy independence, treat to national security, federal judges, originalism, US Constitution, conservative, elections, politics To share or post to your site, click on "Post Link". Please mention / link to America's Best Choice. Thanks! Posted by Bill Smith : Post Link --> 11:04 AM 0 Comments - Share Yours! 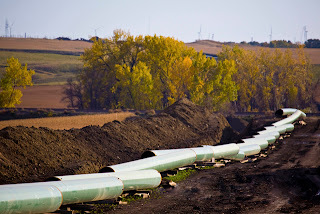 Obama Approves Oil-Sands Pipeline! No, NotThe Keystone. . . . Tags: Barack Obama, pipeline, Keystone, democrats, no oil To share or post to your site, click on "Post Link". Please mention / link to America's Best Choice. Thanks! Tags: lockstep liberals, Senator, Bill Nelson, Barack Obama, Florida, 2012 election, Nelson Obama, Obama Nelson, Lockstep, Liberals To share or post to your site, click on "Post Link". Please mention / link to America's Best Choice. Thanks! Posted by Bill Smith : Post Link --> 4:59 PM 0 Comments - Share Yours!